Congratulations, you’re getting married! You’re slowly coming off of your high of the perfect proposal, and you realize that you now have a wedding to plan. You have to pick a dress, find a venue, choose the flowers, and the list goes on. If you’re already feeling stressed, you are not alone. Roughly 50% of brides find wedding planning more stressful than they imagined, and they reported they spent roughly 11 hours a week planning. One of the most stressful aspects of wedding planning is probably the budget. Paying for a wedding is not always easy, especially because the tab can run really high, really quickly. According to USA Today and WeddingWire, couples underestimate their wedding budget up to 40%. That discrepancy means couples are setting a budget, and then spending significantly more than that predetermined number. Fortunately, there are ways to plan for the wedding budget and actually stick to it. Before you pick out anything, you need to decide what kind of money you are working with. Review your financial situation with your partner so you will be able to plan on how much time you need to save your pennies. After you understand what you can afford, you can start narrowing down venue choices, entertainment options, and more. Once you begin to search for wedding vendors, you should also research how much they should cost. There are plenty of online tools that can tell you how much you should be spending. For example, The Knot can tell you that 50% of your wedding budget should probably go into the reception. Those tools can also tell you the average cost of certain vendors. If you research accordingly, you should have a sound idea of your expected costs. As with anything and everything in your relationship, you need to be honest with your future partner in crime. If you two are not on the same page, your wedding planning can go south very quickly. Communication is key for a venture as large as planning an entire wedding, especially when you’re dealing with money! Financial planning can be difficult, but don’t let it put a strain on your relationship. 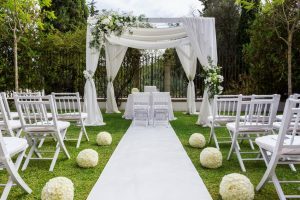 Your wedding should be the happiest day of your life, so just follow these tips to make the journey there as stress free as possible.